China’s Shan Shan Feng and Italy’s Diana Luna lead the World Ladies Championships after Friday’s first round at Mission Hills in Hainan, China. The East-West duo each shot a 6-under 66 to lead by two strokes from Frenchwomen Ann-Lise Caudal, Taiwan’s Candie Kung, American Beth Allen and Ireland’s Rebecca Codd in this event being co-sanctioned by the Ladies European Tour and the China LPGA. Luna dropped shots at the third and fourth holes, but the turning point came when she holed her second shot from 165 metres for an eagle at the fifth using a rescue club. She then picked up five birdies as against a solitary bogey on the 14th hole coming down the final stretch. "My start was very slow," Luna said. "I had two bogeys on the first two par fives, which was a little disappointing of course, because I made six on a par five without any funny shots. A stupid six! "I missed one very short putt on the first par five and then I made a very bad chip at the second so two very stupid bogeys, but then I holed a rescue on the hole after that and that put me right back in play." Luna revealed that she was playing aggressively and almost made hole in ones at the 10th and 13th holes. "You always go for it, of course. I was playing well in Australia a few weeks ago where I finished second and I had some very good scores.I’m in a good moment. I think I’m playing solid golf and I’m looking to be high on the leader board," said the 29-year-old Italian from Rome. Feng, China’s world number 12, delighted the home crowd with seven birdies and just one dropped shot at the sixth. 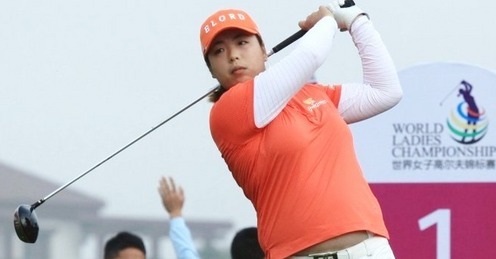 The 22-year-old from the city of Guangzhou said: "The course condition is much better than in the practice round. Distance wasn’t a problem. I used the short irons to the greens. On the par 5s, I need two or three shots to make the green which gave me good birdie opportunities." The Championship, being played over 54 holes of stroke play from Friday March 2 to Sunday March 4, features a unique three-in-one format with players competing as individuals as well as in teams. There are three categories – individual professionals, individual amateurs and professional teams. Feng combined with Yiying Ye for a 10-under-par total to put China at the top of the team leader board, two strokes clear of Candie Kung and Amy Hung the Pair from Chinese Taipei. Luna, playing for Italy with Giulia Sergas’ had an opening seven-under par total in the team event for third position. The Thai duo of Pornanong Phatlum and Nontaya Srisawang are one shot back on six under alongside the Swedish pair of Linda Wessberg and Pernilla Lindberg, with England’s Melissa Reid and Florentyna Parker in sixth place on five under par. In the individual amateur race, featuring eight young players, China’s Yi Chen Liu, 19, is leading after am opening 2-under par 70, one shot ahead of 14-year-old New Zealander Lydia Ko. Liu was one of the first players out of the blocks in the more humid morning conditions in the morning while Ko played her round in much breezier conditions in the afternoon.